James Robert Ballantyne (1813-64) taught oriental languages in India for sixteen years, compiling grammars of Hindi, Sanskrit and Persian, along with translations of Hindu philosophy. In 1859, for the use of Christian missionaries, he prepared a guide to Hinduism, in English and Sanskrit (also reissued in this series). 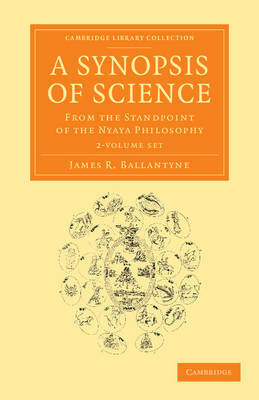 Published in two volumes in 1852, Synopsis of Science was intended to introduce his Indian pupils to Western science by using the framework of Hindu Nyaya philosophy, which was familiar to them and which Ballantyne greatly respected. Volume 1 proceeds through a series of aphorisms exemplifying such topics as Western logic, the workings of the body, basic astronomy, geography, the action of liquids, pneumatics, acoustics and optics. Volume 2 includes coverage of arithmetic, algebra, chemistry, botany, zoology, mineralogy and geology. The second part of each volume is a Sanskrit translation. Overall, the work serves as an excellent primary source on the educational aspects of British imperialism.